It is a decade since Cormac Neeson, Paul Mahon, Micky Waters and James Heatley came up with the slightly underwhelming band name of The Answer, as the vehicle for their hard, blues rock with a Northern Irish accent. It was not until 2005, five years after first forming, that The Answer started getting the recognition they merited, prompting music journalists everywhere to start working answer/question puns. Probably. The debut album, 'Rise', grabbed the attention of Kerrang! and others, earning them support slots for a Whitesnake tour and with Paul Rodgers at the Royal Albert Hall. 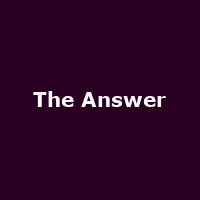 In 2007, The Answer also supported a couple of giants of rock and roll when they opened for Aerosmith and also supported The Rolling Stones and The Who on a handful of dates. Not bad. They followed that with a slot opening for AC/DC on the 2008 and 2009 legs of the Black Ice World Tour, after which their second record, 'Everyday Demons', became The Answer's first Top 40 album in the UK. The third album, 'Revival' (seemingly the last thing The Answer are in need of), was released last month and the band are currently hawking the new LP around continental Europe. After an extensive European tour finally concludes in early February, The Answer return with some Ireland dates and then a UK leg in the spring. The Answer's tour kicks off at Whelan's in Dublin on 2nd March, followed by dates in Belfast, Cork, then over to the UK for their co-headline tour, starting in Leeds, then Glasgow, Aberdeen, Newcastle, Manchester, London (Electric Ballroom) and more, before the final date of the run in Brighton on 17th March 2012. Sharing the bill for the mainland UK dates are The Union, who were formed in 2009 by Luke Morley, ex-guitarist for Thunder, and Peter Shoulder, formerly of Winterville. The Union released their second album, 'Siren's Song', in October. Tickets for the UK dates go on sale at 9AM on Friday 25th November, priced from £15 - see below.